A drug that can reverse potentially fatal opioid overdoses will soon be available to anyone in Washington and Idaho without a prescription. Walgreens and CVS Pharmacy, which operates pharmacies inside Target stores, have both announced plans to begin offering naloxone without a prescription later this year. Naloxone, also known by the brand name Narcan, stops overdoses within a few minutes and can be lifesaving. It’s often administered via a nasal spray, making it easy for people with no medical training to use. The Spokane Fire Department responded to 251 severe opioid overdoses in which naloxone was administered in 2015, according to a department report. About 80 of those patients were in respiratory or cardiac arrest when first responders arrived. Three-quarters of them survived, in part thanks to naloxone. Public health officials say naloxone is a promising antidote to a surging number of fatal overdoses on heroin and prescription painkillers. In Spokane County, heroin-related fatal overdoses climbed from seven in 2014 to 22 in 2015. Statewide, heroin-involved overdoses more than tripled between 2010 and 2014, Washington State Department of Healthdata shows. “It’s still early to say if it’s going to reverse this dramatic upward trend in overdose deaths,” said Dr. Matt Layton, a psychiatrist specializing in substance abuse who teaches at Washington State University, Spokane and serves as medical director for the Spokane Regional Health District’s opioid treatment program. But early reports across the country demonstrate naloxone’s “lifesaving potential,” he said. Washington and Idaho both passed laws last year extending Good Samaritan protections to lay people who administer naloxone to someone who is overdosing, and allowing pharmacists to dispense the drug under a standing order from a doctor, rather than requiring individual prescriptions. Both state laws also allow third-party prescriptions, meaning a person can buy the drug to use on someone else. Layton said third-party prescriptions can allow friends who use heroin in groups to treat each other in case of an overdose. But families with chronic pain patients should also consider buying a naloxone kit, he said, in case children accidentally get into the medication and take a fatal dose. “It’s saved a lot of children’s lives,” he said. As of April, 44 states and Washington, D.C., had Good Samaritan laws for naloxone on the books, according to a report from the Network for Public Health Law. Most were passed in 2014 or later in response to a surge of fatal overdose deaths from heroin and other opioids across the country. Many also allow standing orders and third-party prescriptions. The Health District’s needle exchange program has offered naloxone for free under a University of Washington grant for about six months, Layton said. They’ve distributed about 50 kits and received reports of two lives saved with them. People buying the drug at pharmacies will likely be able to get it covered under insurance if the drug is intended for use by someone on their health insurance plan. Layton said many health insurance plans, including Washington’s Medicaid program, Apple Health, typically cover it. 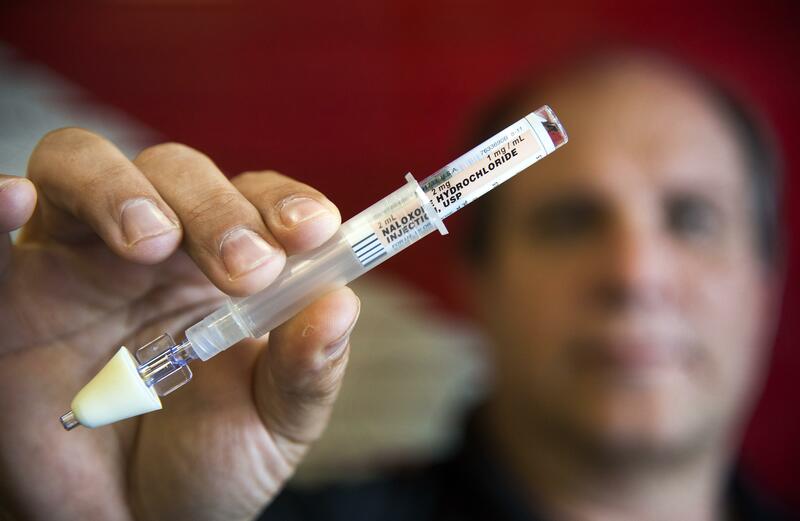 A naloxone kit costs the Fire Department about $24, Assistant Fire Chief Brian Schaeffer said, but over-the-counter kits cost upwards of $26. A CVS spokeswoman said the pharmacy plans to offer the drug in two-dose kits at a cash price of $90 or less. Schaeffer said he’s happy to see access to the drug expanding. He added that people should still call 911 or take someone who has overdosed to the emergency room after administering naloxone because the drug wears off quickly. “The thing that saves their life is Narcan for the first five, 10 minutes. Once the medication starts to wear off, they can relapse,” he said, referring to naloxone by its brand name. Rite Aid has been offering naloxone without a prescription in Idaho since February, a spokeswoman said. Rosauers has no current plans to begin offering the drug without a prescription, Chief Operating Officer Mike Shirts said. Naloxone will be available at CVS Pharmacy in Idaho starting mid-July and in Washington starting in early August. A news release from Walgreens said the drug would be available in both states later this year. Published: June 2, 2016, 4 p.m.